Brinkley Davies is an Aussie native residing in beautiful Port Lincoln, South Australia. Not only does Brinkley take some incredibly stunning shots (check out @brinkleydavies, trust us it’s worth it!) but she’s also a PADI®Divemaster, founder of the Balu Blue Foundation and ‘Australian of the Year’ nominee. Phew, we think that’s pretty impressive! Not only do we love following Brinkley online for her inspirational diving photography and updates about her environmental conservation efforts, but we also love seeing Brinkley’s beautiful fur-babies, her rescue kangaroo (yes you read that correctly, kangaroo!) Bunji, as well as her beautiful pet pooch Ohana. Brinkley’s an amazing woman, and we’re inspired by her efforts in ensuring our ocean home is clean and protected. Brinkley was kind enough to have a quick chat with us about what we all have in common here, our love of the oceans! Why did you decide to take up diving? I have always loved the ocean ever since a really young age and after surfing all my life I knew I wanted to explore the underwater world as much as I could. I took up scuba diving after freediving for a few years, and ever since, scuba has been an amazing addition, allowing me to see some incredible things over the past few years. Where has diving taken you? All over the world! Hawaii, Fiji, Bali, Florida, and my absolute favourite, Ningaloo Reef, here in Australia. At this stage in my life, it would be a hard equal to Ningaloo Reef and Beqa Lagoon Shark Dive in Fiji. 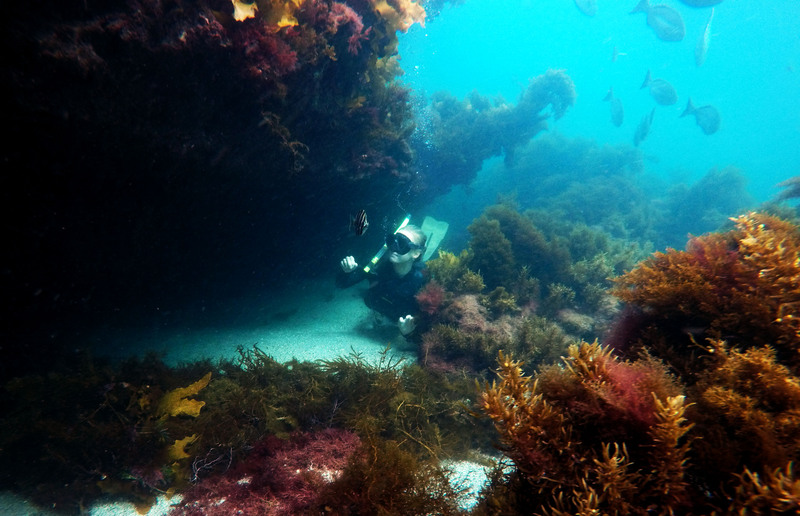 Tell us about diving in South Australia. It’s cold, always surprising and absolutely beautiful. South Australia has some incredible marine life, and if you’re game enough to brave the cold in the winter months, you’ll find yourself face to face with huge congregations of cuttlefish. For the even more adventurous, head out to Neptune Islands and cage dive with some Great White Sharks. Or if you like the smaller things, Tumby Bay is the place to find a leafy sea dragon or two :). What has been your most memorable dive moment to date? It would have to be seeing Bull Sharks in Beqa Lagoon, Fiji, with Beqa Adventure Divers. I can’t recommend this dive enough. From a distance it may sound daunting, but once you’re down there it is truly magical – crystal blue waters, up to 100 bull sharks, and such professional crew with an amazingly safe system! Mike Neumann and his team are incredible. What is the best thing about being a PADI Divemaster? I enjoyed learning about the safety component through my course, which allows you to dive with confidence, and enjoy really great dive sites with other experienced divers. Being a PADI Divemaster has allowed me to work in some amazing places, and be surrounded with experienced and exciting crew. Your fur-babies, Bunji the rescue kangaroo and Ohana the dog are quite the Instagram stars. What is their relationship with the water? Ohana is absolutely obsessed, if it was up to her she would never get out, she even gets in her own water bowl at home. Bunji, to our surprise, hopped in the water and came for a swim one day. I’ve always known Kangaroos bathe in the ocean down here, but had never seen it with my own eyes! She comes to the beach with us a lot, but mostly hangs out on the sand, digs around, then lays down haha. Tell us about a woman in your life who has inspired you most in your diving career. I’ve been inspired by a lot in my diving career, so I can’t really pin it down one inspiration. When I was younger, Valerie Taylor inspired me to get into diving, her original fishing career turned shark conservation career inspired me from a young age that even in the most hostile environments you can promote conservation and change. I live in Port Lincoln, conservation down here is mostly something people don’t recognise or care about all that much. These days though, we have a lot of power and support from the rest of the globe, and a generation of people who care about their coastline and marine life, and aren’t afraid to speak up, which is great. What has been your most memorable moment with marine animals to date? 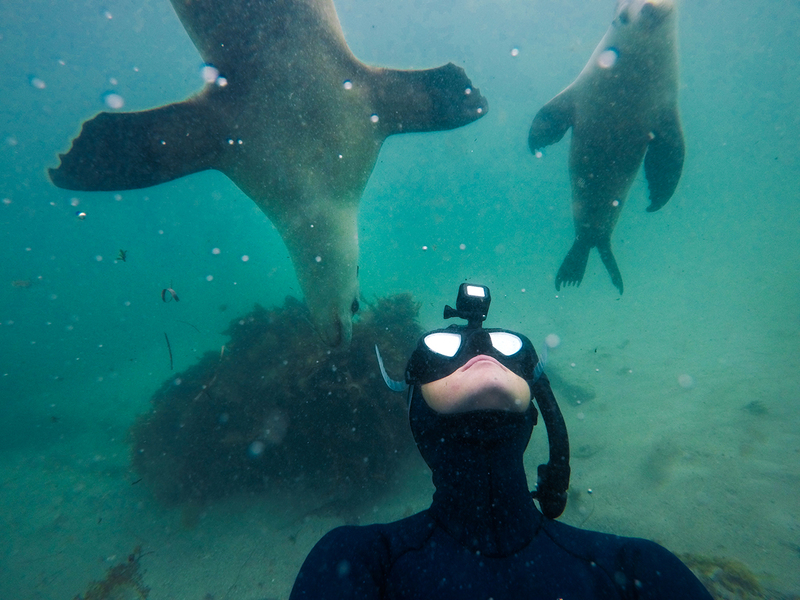 I’ve had a few encounters with marine animals which have inspired me so much both freediving and scuba diving. I had a crazy swim last year on Ningaloo with a female Manta Ray who swam belly up with us for close to 1km, it was such a humbling experience. Sometimes you just really feel like you are in the right place at the right time. What actions do you take to ensure our oceans stay clean and healthy? What can people do to help? I run a Not-For-Profit organisation called Balu Blue Foundation, we are currently running a campaign called Clear Tides. 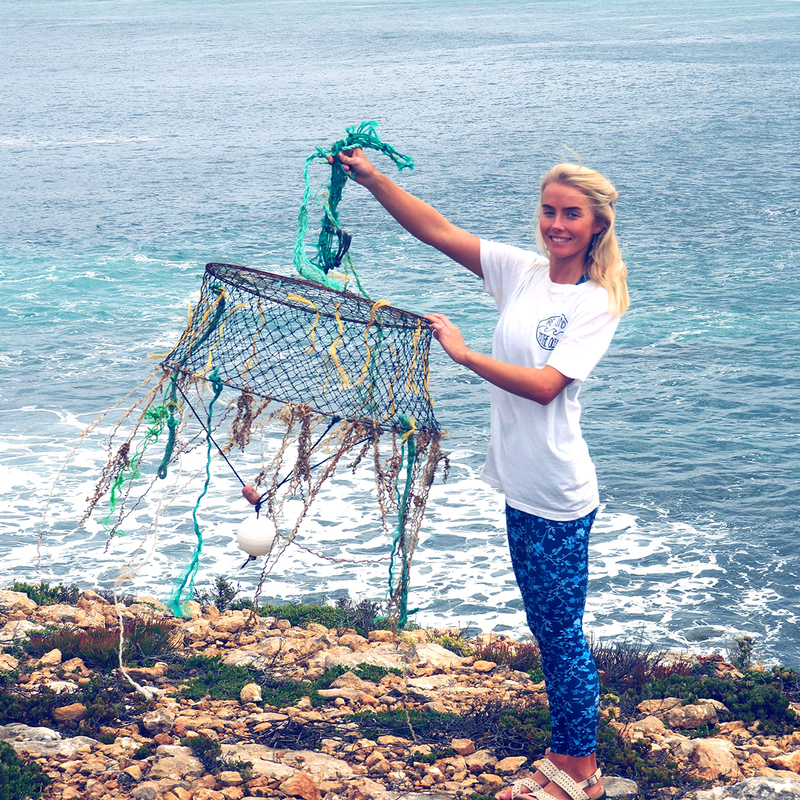 We run beach clean-ups on the shore, along with educational talks at schools about how people can reduce their use of single use plastics, and encourage them to clean their beaches whenever possible. I personally do my best to not use single use; swapping plastic items such as straws, coffee cups, water bottles and plastic bags, and swapping to reusable items is a great start. They are simple swaps which, when everyone makes the change, the make a big difference. Can you tell us a bit about how the Balu Blue Foundation came about? For a few years I had been wanting to have a basis for all the work I do, and for plans I have in environmental conservation, whether that be research, educational work, or conservation projects, so I founded Balu Blue Foundation Inc, last year in November. The name was inspired by our pup my partner and I had, named Balu, he was our whole world, and last year we sadly lost him to 1080 fox bait, a horrific poison used here on farms and national parks. . It devastated me for months, and gave me the push I needed to just go ahead and reach for my dream- – to educate people on how special our native wildlife is here, and how unique our oceans are, as a start. 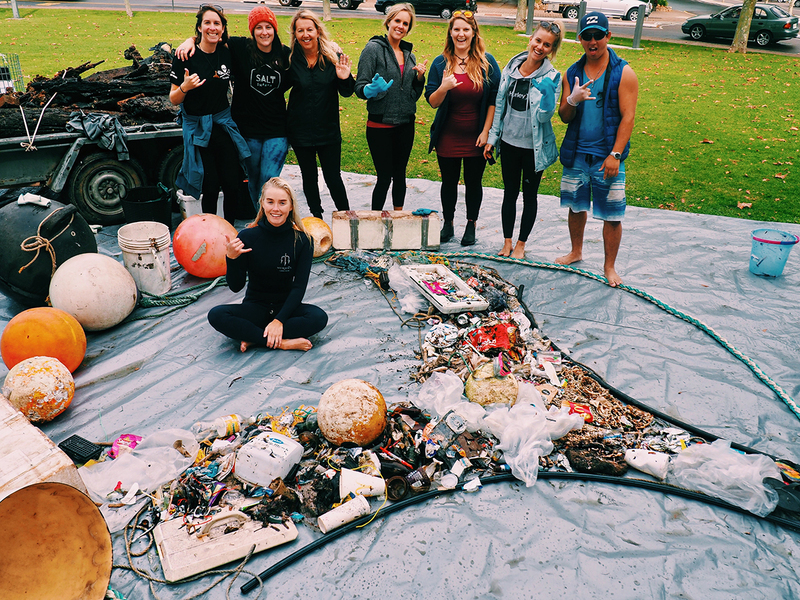 Thanks to our campaign Clear Tides, we’ve removed close to 2000 pieces of rubbish here from Port Lincoln Foreshore. We screened the documentary Before the Flood as a public event here as a part of SALT Festival, are running clean-ups in other states, bringing on educational ambassadors to speak at schools interstate, and working on plenty of other things behind the scenes for the organisation. It’s all very exciting! This year you were an official nominee for Australian of the Year. What does that mean to you? I was so appreciative and happy to receive this. It means a lot to me, that the people who follow my social channels and want to get involved in diving or environmental conservation, appreciate my journey and are inspired by it. One of my biggest goals in all of this is to inspire young people to create a career for themselves that is kind to the environment, and not be afraid to get out there and explore this planet. There’s heaps of great organisations out there spearheading conservation projects and making a difference. If you want to start by helping clean up the coastline, get in touch with Balu Blue Foundation OR, if you’re more interested in using your scuba skills to clean up the oceans, head over to Project AWARE’s website and sign up to Dive Against DebrisTM or even Adopt a Dive Site if you’re regularly visiting the same dive site. You can also help celebrate all the incredible women we have in our industry like Brinkley Davies. Find out more at padi.com/women-dive.